How crazy is it that both of my sisters are also into cooking? I like to give our mom credit, she definitely encouraged us to cook once we were old enough to be trusted with the stove, never mind that she did so because she hated cooking, it still gave all 3 of us our start in the kitchen! This week's featured cook is my fabulous younger sister Molly. I love this kid like crazy and should probably stop referring to her as a kid since today is her 27th birthday and she's getting married next month. Yeah, I'll never stop calling her a kid, it's inevitable at this point in our lives. 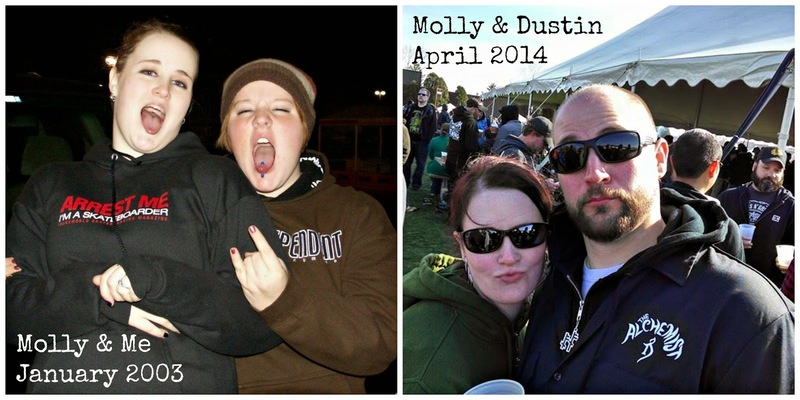 Obviously I've known Molly for all of her 27 years, but I really cherish the years we lived together out in Indiana. We grew up in Maryland (in a DC suburb), but I left when I was 18 to go to college in Northern Indiana. About a month before my college graduation (and Molly's subsequent high school graduation) she called me and said, "I don't really want to go to college, but I don't want to stay here. Can I come live with you?" Pretty hilarious history...we ended up living together as "adults" for a few years and I love that we were able to reconnect and get to know each other as adults. I miss her like crazy all the time and kind of hate how far away Indiana is from Maryland these days. She lives in Northern Indiana with her fiance, Dustin and is a bartender at a restaurant where she's been working since 2005. She loves to incorporate booze into her cooking and baking and has started a small cupcake business that she would love to expand into a full-time job and bake shop eventually. 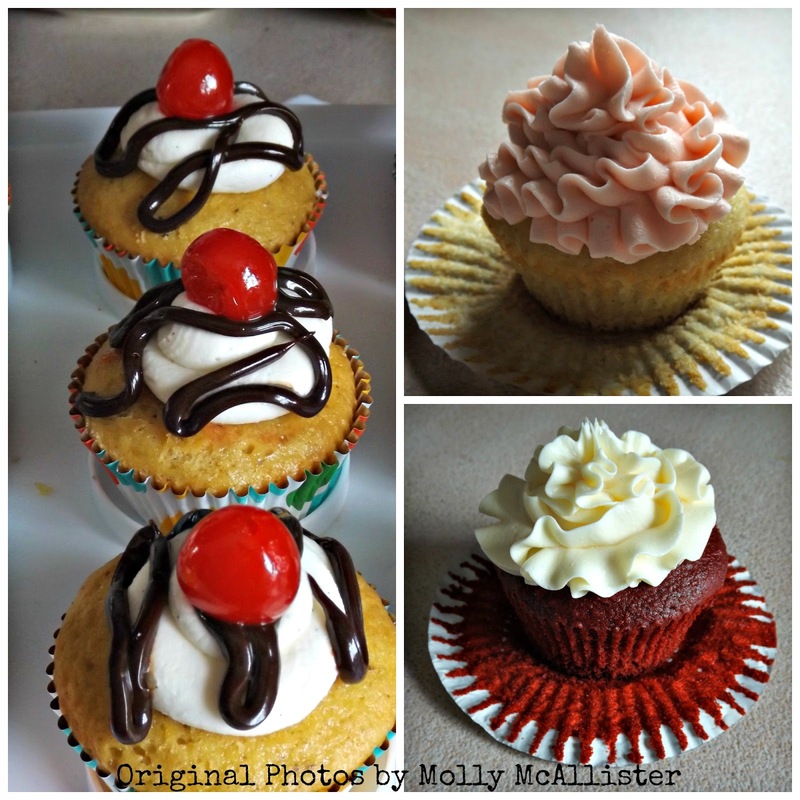 Below are a few photos of some of her favorite cupcake creations. Another recent interest of hers is brewing her own beer. Her fiance is an incredible brewer and she often steals his spent grain (the grain after it is milled and drained from the beer), dries it and makes her own flour with it. She's discovered it adds an amazing nutty flavor to any bread or pretzel recipe, plus it is a healthier substitute for processed flour. In her never-ending quest to add more booze to recipes, she loves adding hops to her spice blends, adding body and aroma to a variety of spices. She focuses on local food and is fortunate to be able to purchase produce, milk and eggs that are made just down the road from her home. Why do you cook at home? I cook at home because I like to make healthy food with organic ingredients as often as possible. My fiance and I love to run and work out together so I try to make food that is both delicious and healthy. What is your favorite ingredient to cook with and why? Fresh seasonal produce! I live in Indiana so fresh corn and tomatoes and other seasonal fruits and veggies are easily accessible from the roadside stands the local farmers have open in the Spring and Summer. I LOVE fresh tomatoes the best, there is nothing better to me than a big beautiful summer tomato! If you could travel anywhere just to eat the food, where would you go? I would take a trip to Greece in a heartbeat, I love Greek food! Spanakopita is one of my favorite things to eat for sure and who doesn't love baklava? I'm sharing my recipe for Tarragon Chicken with a side of Baby Leeks w/ Herbed Vinaigrette. This is a perfect Spring/Summer dish and can really showcase bright, delicious flavors. And, Molly, those cupcakes are GORGEOUS!! !